In honor of Earth Day on Friday, April 22nd, we are offering all of our Nature Maestro apps as free downloads. Go to the iTunes store and download any or all of them. Create a soundscape and send the soundscape to me. I will upload your creation to Soundcloud and post the audio and image on this website. I'll only use first names and last initial and the State you are from! Sound recordist and composer Dennis Hysom is your guide. 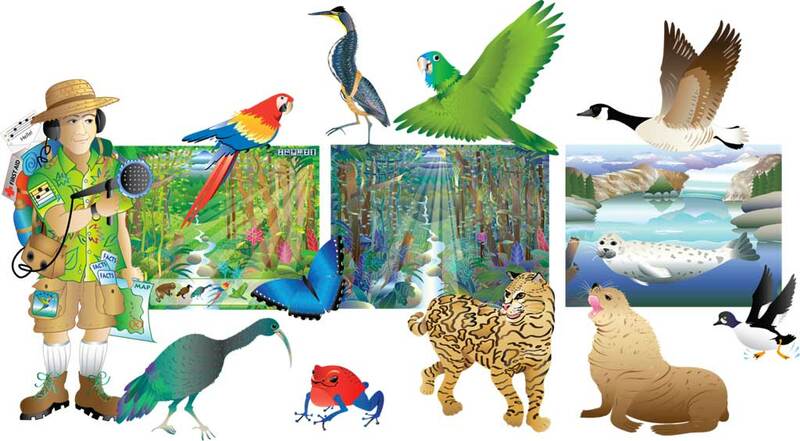 Compose soundscapes using authentic animal sounds Dennis recorded in rainforests and other biomes. Build audio-rich, imaginative scenes using beautiful illustrations. Share your soundscape audio and visual creations with friends and family! Discover fun facts about animals. Play audio and visual matching games. For the home and classroom. Standards-based curriculum, CCSS. Enjoyment for the whole family.